NEW YORK— Apple CEO Steve Jobs has finally agreed to participate in a book about his life. 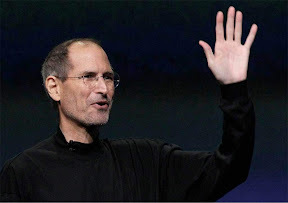 Simon & Schuster announced Sunday that Walter Isaacson's "iSteve: The Book of Jobs" will be published in early 2012. Isaacson has been working on the long-rumored biography since 2009 and has interviewed Jobs, members of his family, colleagues at Apple and competitors. Many Jobs biographies have been written, but not with his authorization. He reacted to at least one book with active disapproval. In 2005, Apple banished works by John Wiley & Sons from its stores because the publisher had signed up an unauthorized biography, "iCon: Steve Jobs, The Greatest Second Act in the History of Business," by Jeffrey S. Young and William L. Simon. Few biographers are better connected than Isaacson, a former top executive at CNN and Time magazine who has written best-sellers about Benjamin Franklin and Albert Einstein. He is currently the president and CEO of the Aspen Institute, a "nonpartisan educational and policy studies institute" in Washington, D.C.
"This is the perfect match of subject and author, and it is certain to be a landmark book about one of the world's greatest innovators," Jonathan Karp, publisher of Simon & Schuster, said in a statement. "Just as he did with Einstein and Benjamin Franklin, Walter Isaacson is telling a unique story of revolutionary genius."